The house of death is merely just a nickname for this normal looking town house built in the 1850's. Located on one of the cities more picturesque blocks on 10th street, the house doesn't really have a very in depth or particularly interesting history, though it is known for being a resident of Samuel Langhorne Clemens who was more commlonly known as Mark Twain. The house was built in the Greek revival style and this ordinary building, before landing its grizzly name was home to many of the cities elite, including Mrs. James Boorman Johnston whose husband had been a founding member of the Metropolitan Underground Railroad and the Broadway Underground Railroad. The house operated as a single resident until 1937 when it was turned into 10 different apartments. Today the building, located at number 14 10th street is just an ordinary set of apartments. There is a small plaque outside the front door on one of the old gate posts in remembrance of Mark Twain, although he only lived in the house for 1 year between 1900 and 1901. Is the House of Death Haunted? As you can imagine any house which has been nicknamed the house of death probably isn't going to be known as a friendly and welcoming place with a nice past. Why this place is so haunted seems to be a mystery, as is why there is such a high number of spirits here, 22 by the count of one paranormal investigation team who visited the property. As you may have guessed the most famous ghost to reside here is thought to be that of Marc Twain himself whos apparition has been seen wearing a white suit and most often seen on the first floor near the staircase. One of the most well known accounts of his appearance came from a mother and her daughter who claimed to have seen Twain sitting in the corner of their room near the window were he turned to them and stated" My name is Clemens and I has a problem here I gotta settle" before fading away into nothing. Various other people have claimed to have seen him in various areas of the building and all have claimed to have seen him dressed in the same white suit. 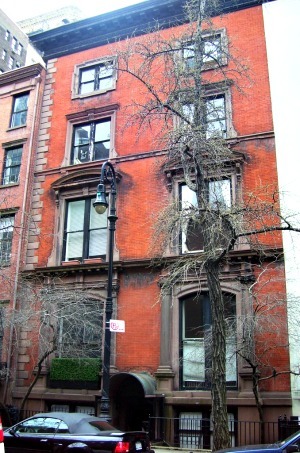 One account of the building hauntings were reported in the New York post when actress Jan Bryant Bartell and her husband moved into the area of the old servants quarters on the top floor. They both claimed to immediately feel the presence that she described as "a monstrous moving shadow". She later wrote a book were she documented her paranormal experiences there called "Spindrift: spray from a psychic sea" which she released in 1974. Since the house is called the house of death you may expect there to have been at least one murder here, and you would be right. In the year of 1987 a former New York defence attorney named Joel Steinberg was living in one of the apartments with his illegally adopted 6 year old daughter, Lisa. Around 7am one day in November officers came to his apartment responding to a call about a child not breathing. Upon entering the apartment they found Lisa unconscious and also a baby who was covered in filth and tied to a playpen. Lisa suffered from brain damage and died a few days later in hospital, though fortunately the baby survived. Joel Steinberg was charged with first-degree manslaughter for beating the child unconscious which led to her death, though he was recently released in 2004. As for other ghosts here the various paranormal groups that investigated the place have come to a common understanding that there are at least 20 ghost which reside on the property. These include a lady in a white dress, several children, a tall faceless man and even the ghost of a cat. Who they are however and why they are there seems to be something that will forever remain a mystery as there are no official records to account for 20 deaths in the building.